This is KJA Khan an Arabian gelding born 06/15/1988. These photos of his teeth were taken on 03/14/2009. He was 7577 days old or 20 years 9 months. 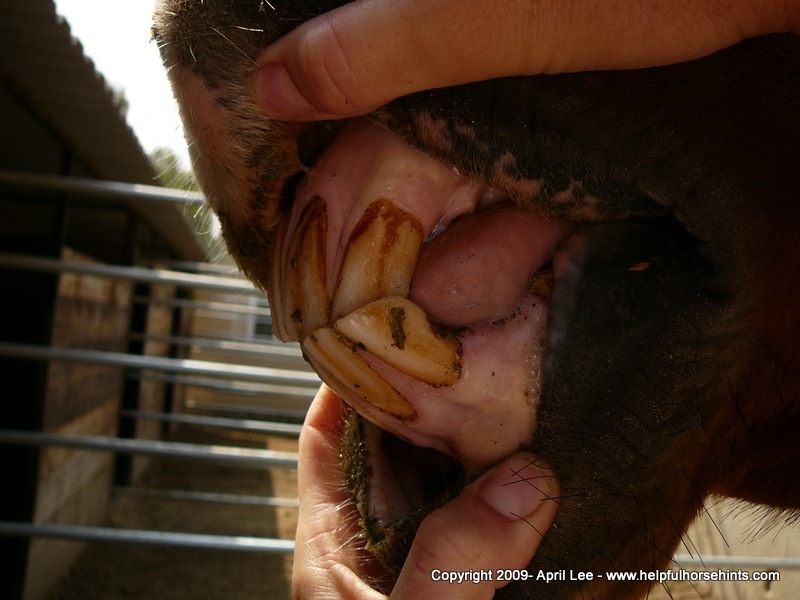 While looking at a horse’s teeth can’t tell you the exact day he was born, it can give you a general idea. Experienced horsemen can look at the shape of the teeth, the cups, the Galvayne’s groove, the angle and the length to make a best guess as to how old the horse may be. On both sides of this horses mouth we can see his Galvayne’s groove only goes down partially on the right tooth. A Colorado State University article says Galvayne’s groove would be halfway down the tooth at 15 years old. If you had looked at only the right side of this horse’s mouth and you may have believed him to be younger than he is. Right side of Arabian’s Mouth. This 20-year-old horse has a Galvayne’s Groove only showing halfway on this side. On the left hand side we can see the groove extending all the way down as indicated by most documentation and horse age charts. The left side of the above horses mouth shows a Galvayne’s groove more typical for a horse of his age. In addition we can see the length and angle of the mouth. When aging a horse using his teeth as a reference guide, you should take into account the angle and shape of the horse’s teeth. Younger horses have wider, shorter teeth and older horses typically have narrow, longer teeth. Long, narrow teeth are signs of an older horse. There are some cases where teeth can’t be accurately used to age a horse. Most commonly this is due to unnatural wearing caused by cribbing. 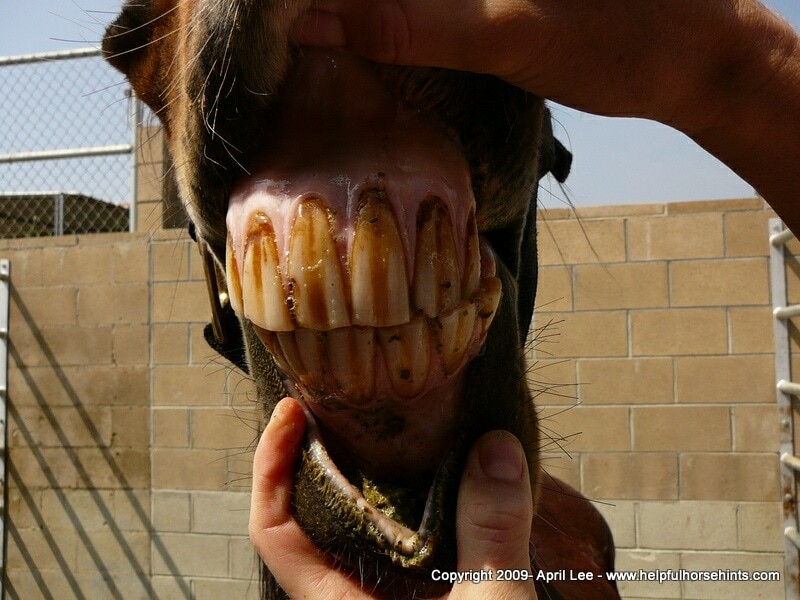 Horses who crib will often grasp anything they can causing their front teeth to wear down at a fast rate. In fact, they can even lose their teeth. Injuries to the mouth or teeth can also impact a horseman’s ability to accurately guess age. Missing teeth or damaged teeth may appear shorter or rounder. It is imperative that you schedule regular dental appointments with your veterinarian so he/she can assess your horse’s health. During a routine exam the vet will also check your horse’s mouth and let you know if the horse’s teeth need to be floated or if any dental issues are present. 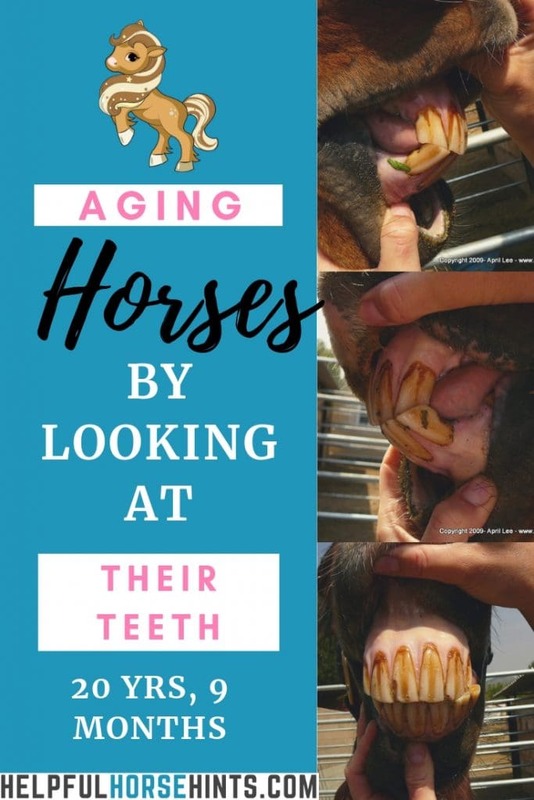 The best way to learn how to use a horses teeth to guess age is to look at the mouths of lots and lots of horses of different ages. Even if you don’t know exactly how old they are, you will start to see the differences between young horses and older ones. From there, start looking at registered horses. Presumably we know the exact day these horses were bor and so can compare their teeth to their papers. Such is the case with the horse above. As a registered Arabian, we were able to calculate exactly how old he was when these pictures were taken. Telling a horse’s age by its teeth takes practice and skill. This is a 20 year old horse and we can clearly see his Galvayne’s groove. The shape and length of his teeth are also indicative of a very old horse. 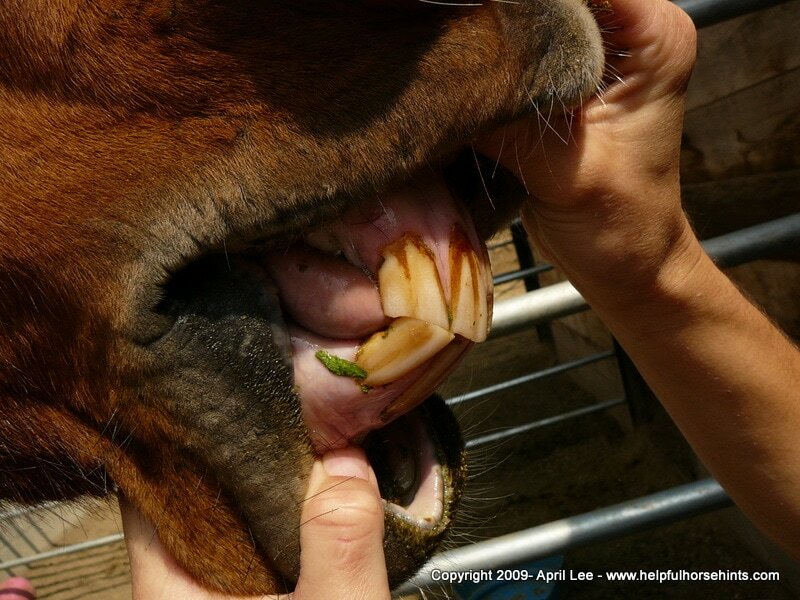 Aging horses by their teeth is a very good skill to learn as a horseman. The more teeth you look at, the better you will get!